After a couple of months and (presumably) a bunch of emails, Google Maps fixed the bug that was giving me grief and preventing me from posting about my Portland Bike Trip. Without further ado, you can now read my thoughts & summary of the trip. I went Monday night to Benaroya Hall to see Joanna Newsom. After going last December to her concert at the Showbox, I was curious how it would be to see her with a full symphony and in a much larger venue. The orchestra behind her was talented, but actually made the experience a lot less intimate – I felt her most successful songs were either solo or with the small band, when they dimmed the lights on the symphony and highlighted her (or the band) with spotlights. Overall, it was still a great evening, and if she’s performing near you, check her out. After reading about a 7th Circuit Court decision that effectively allows prayer in the Indiana State Legislature, it occurs to me that Bush’s worst legacy might not be the policies he leaves behind, the damage he’s caused to US credibility overseas, or even the war in Iraq, but the prevailing attitude by politicians and judges that if they don’t like what the law says, they can just ignore it. Then again, the other stuff is pretty bad, and it’s hard to say which is worst. Some friends and I signed up to participate in the annual Winter Pineapple Classic next weekend – a 5K, Hawaiian-themed fun run (with obstacle course) in Seattle. Should be a hoot, especially since we’re planning on running in coconut bras. It’s also a fundraiser for a good cause, the Leukemia & Lymphoma Society. If you’re interested in giving (which would be much appreciated), you can do so here. If you’re just interested in seeing photos of us in coconut bras (understandable), check back after next weekend. Told you it was short. I’ve started playing around with WordPress a bit, and so far I’m impressed. I was a little wary of the installation procedure, but it went off without a hitch (guess you don’t get to be a successful open-source software package if it’s a pain to download & install). I wonder, does Blogger get jealous when people post on it about other blogging software? I was a little worried that I overcooked the custard base last night for the coffee ice cream I’m making, but it appears I managed to save it. And boy is it tasty! It’s also got great texture. 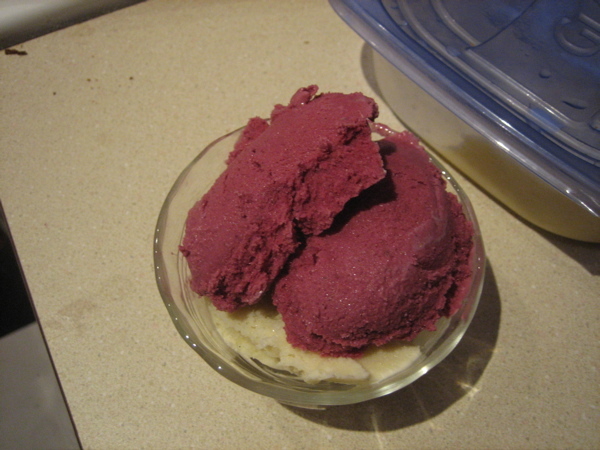 According to this page, there are a few ways to keep homemade ice cream soft. I used heavy cream for this recipe (as opposed to last time, when we just used half & half), added a little alcohol (good vodka that doesn’t really add a lot in the taste department), and used the recommended amount of sugar. Right out of the ice cream maker, it had a very custard-like texture, and was much creamier than the last batch. We’ll see how it holds up after a day in the freezer. The site redesign is proceeding, at least in my mind (no bits have been committed to disk). Drew had some good thoughts on using WordPress. Probably will be a while before it shows up online, though, especially with the several other projects I have going, including a resume redesign, a scarf, and of course the robot arm. Though it’s not exactly down the street from my house, and it’s not as impressive as McClendon’s or Hardwick’s, I’m glad that City Hardware opened up in South Lake Union/Cascade (that ambiguously named neighborhood near REI). It’s nice to have a real hardware store (sorry Pacific Supply) relatively close by. As I was looking through the site this afternoon, I noticed a bunch of outdated links and pages, and I’m getting a bit tired of the overall look. Time for a redesign? I think so. Fly to Italy, play at Paganello, rent a car, drive to Vals, relax in baths, drive to Munich, visit friend, fly to Pristina, visit friend, return to Seattle. Too bad it’s six months away – sounds great! I’m starting to piece together a European trip for sometime in the relatively near future – perhaps this winter or early spring 2008? On the list include visiting a friend in Munich, a friend in Kosovo, and spending some quality time here. Anything else I should do in that neck of the woods? After the Craft Day ice cream came out closer to sorbet, Pamala was motivated to do some reading about milk, cream and half & half online; she pointed me to this list of dairy products and their fat content. The blackberry ice cream recipe calls for 2½ cups of heavy cream and 1¼ cups of milk (unspecified type). This yields a mixture that’s 23-26% milkfat. We used half & half alone, which is just 12% milkfat. That definitely explains why our ice cream was more like sorbet. Definitely not a failure, but lesson learned. The Soapbox race on Saturday was a total hoot. We had a couple thousand people come see our car, with maybe 10,000 watching the race. Thanks to Dan for taking some photos, including a slightly out of focus sequence of our spectacular crash. We didn’t win, but we’ll definitely make the highlight reel. We made more ice cream yesterday at craft day. This blackberry recipe came out somewhere between ice cream and sorbet, as we used half-and-half exclusively (rather than a majority of cream as the recipe states). We also reduced the sugar considerably – to about half a cup – and it came out perfectly.